Arctic sea ice volume is up 8% since 2008, with a huge expansion of the area covered by thick ice. According to the official Nobel Prize winners and prophets of the Democratic Party, the Arctic was supposed to be ice-free by now. 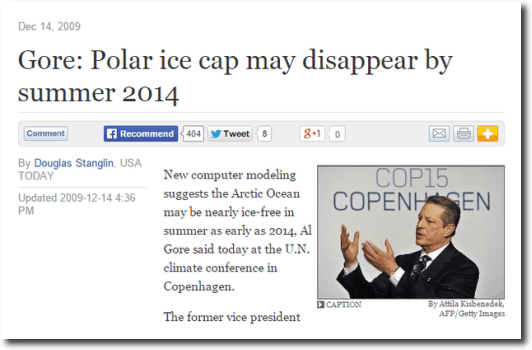 In 2008, climate experts announced the demise of multi-year ice. Now there is lots of multi-year ice. According to the climate experts who have been wrong about everything for the past 50 years, this large increase in ice is actually a meltdown. Well the hook is well baited for the Griff and Sir fish. Hope your using light tackle. 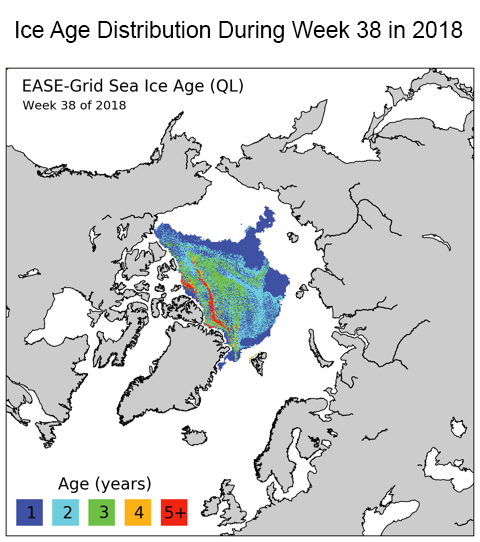 Note multi-year ice is not yet at Svalbard but is stretching across west ward and blocking exits to the south, such as Nares (much of it) and Fram Strait and on toward Banks Land. The blocking ice can get broken with powerful storms and waves. Then ice can ride the currents south and melt in warmer waters. Think ice and the Titanic. Storms broke things up in 2007 and ice bergs flowed south via several routes, making for entertaining images. Also very educational. Of course, there was alarm among the green cult. As there will be when it happens again. Episodic events such as this outflow of multiyear ice are not predictable. They are to be expected, however. The ice is still broken up and flowing through the Nares strait, no arch formed yet. CryoSat now has data for 2010-2018 with November 2018 being the last month given. The only year where average thickness for November was greater was 2013, and that only by 3.5 cm. Overall volume has only 2013 and 2014 higher (though 2014 was less than 40 km3 and 2013 just over 400 km3 higher). It will be interesting to see how the December numbers come in. 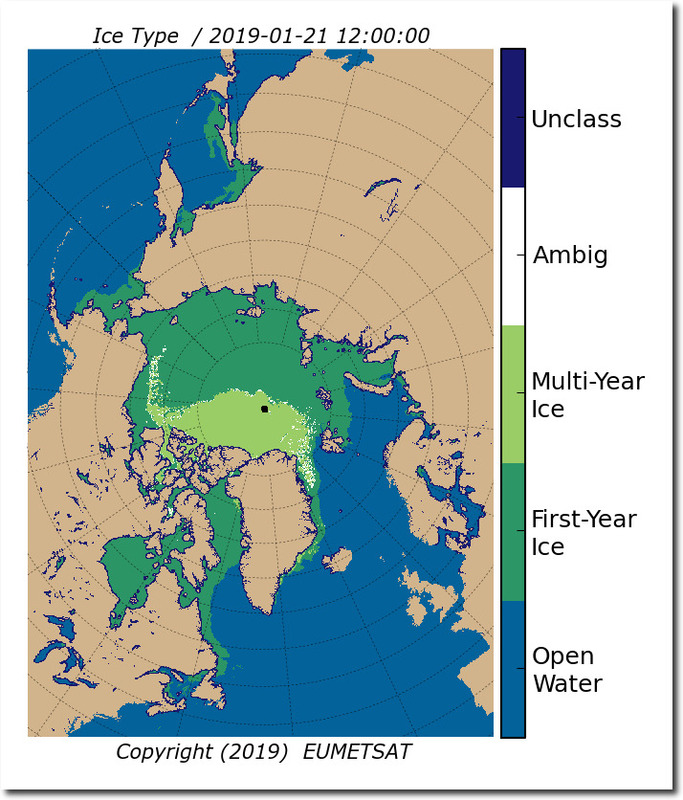 The Russians have a good graphic of the multi-year ice that has survived since the recent minimum. It shows somewhat more MYI area than this version. There is an arm that extends up into the Siberian Sea section, a bit East of the Islands that is not on this graphic. The NSIDC defines multiyear ice as—ice that has survived at least one melt season. So, the Russian graphic fits the MYI criteria. The reference to 3/4/5 year ice is a good example of moving the goalposts. My post is pointing out the lower amount of MYI in the EUMESAT graphic relative to an alternate, reliable source. The one graphic I have seen that separates out the ice ages clearly showed that the volume of the oldest ice ages increased a bit last year. Nothing like the “good old days”, but a step up instead of down. 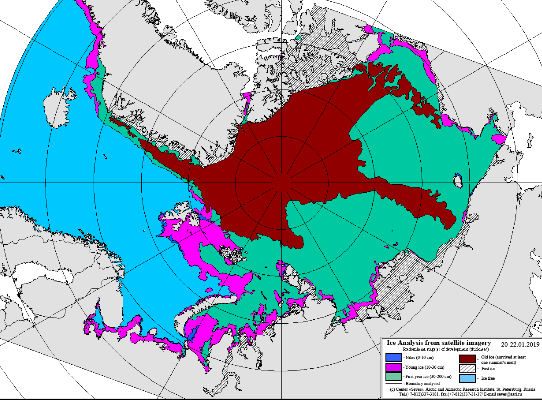 The movement of some of the pack ice, including MYI, out of the basin through the Frame Strait and Nares Strait is a well understood process that occurs EVERY YEAR, through out the year. How the winds will blow has yet to be seen. The expansion of the MYI pack toward the Beaufort/Siberian side of the basin, away from the Frame outlet, is a positive sign of continued growth. We shall see with time. The interesting part about that is how little of the ice was blown in that direction last year. There are a couple of different definitions used for MYI, the other one is ice that has survived two melting seasons. That ice has a different character, very little salt and stiffer and is a more logical use of the term ‘multi’. Usually those who use that definition have a second year ice classification. Most of the MYI shown in the graph by Tony will be 2YI since the 3YI and 4YI has largely diminished in recent years. So it’s not Arctic warming, not warmer Arctic Ocean temperatures, but prevailing winds which have caused the decline in multi-year ice just like in 2007? Congratulations, griff … you finally have seen the light. 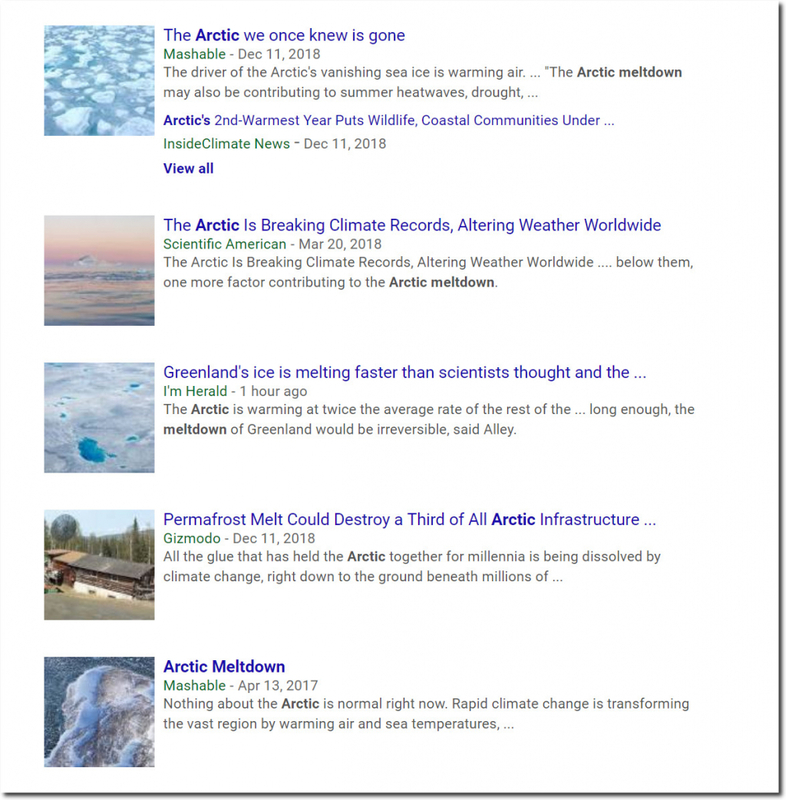 Tony’s data is not “cherry picked” but now predicted by NASA who now also state that the Arctic won’t be ice free for a few more DECADES and possibly until the start of the NEXT CENTURY. By contradicting official sources, all you are doing is scare mongering. You ought to take a cue from the other AGW proponents and move on to the Antarctic now; the Arctic has been milked for all it is worth. This one shows a bit more MYI. Both versions miss the MYI that accumulated in the Can.Arch. this past year. I am pretty sure there are as many other ice thickness measures/charts as they need to get the results they want as there are as many “adjustments” as they need to keep their fairytale alive. as this is the reason why the old ones got replaced. and that’s the reason why conservative,agenda&politics free predictions in climate are more accurate than the rest. I appreciate your simple, targeted posts. You hit the bull’s eye so many times. Thank you. I never thought of myself as conservative, but as a libertarian Constitutionalist – “liberal.” When I was young, I thought the Democrats were closest to that. When Reagan was POTUS, I liked what he said, but I saw the influence of his VP and the deep state in that administration, and I didn’t like it. So I remained a Democrat. I was very concerned when “New World Order VP GHWB became POTUS. I saw supposed conservatives accepting and promoting policies that I was opposed to. These supposed conservative politicians became known as “neocons” – globalist interventionists that militarily overran other countries in the name of democracy and also made terrible trade deals that hurt the U.S. The Bush years were a disaster for the U.S. I thought Clinton was the answer to that. Some time later I found out Clinton was a Bush friend and realized he was a puppet of the same deep state Bush worked for. So, you can imagine my joy with W, and Obama. I was so very disillusioned, and I left the Democrat party in 2011, not trusting leaders of either party. In 2016, without hesitation I voted for Donald Trump. I am very happy that imperfect President Trump is leading the country. I see – daily – how the deep state hate him, on both sides of the imaginary political spectrum in the D.C. swamp. That is HOW I know I am on the right side of history – if he was getting praise from CNN, I would NOT be praising him. MAGA. Make America Great Again! So someone (or a team of someones) went out and literally measured ice thickness over the whole arctic, taking core samples to determine ice depth? What was the grid used for these”actual” measurements? What grid dimensions would you recommend? Remember that for “actual measurements” that there can be no averaging the depths between sampled depths at two locations. So one must assume a continuous measurement across the entirety of the arctic. We can also assume since these are “actual” measurements, they must needs be updated daily, or at least weekly. How big is the crew that compiles these measurements? How many support personnel are required to support such an endeavor? Are the “actual measurements” perhaps taken using some sort of ground penetrating radar instead of taking a core sample? But wait, that wouldn’t be an “actual measurement”, but a model based on parameters remotely gathered. So never mind. How long does one team take to make one reading. That way we can combine that with the grid and the support personnel to calculate the man-hours required to undertake such a massive task? Can you calculate the amount of fossil fuel required to make such an endeavor possible? Or am I missing something here? Are the “actual measurements” done by a fleet of submarines taking “actual” measurements from below? Remember, no radar of any type, because that’s based on a modeled algorithmic equation. Am I misunderstanding what the words “actual measurements” mean? No, Ms Griff is just showing her ignorance and/or hatred of poor brown people again. She just cannot help herself. As Griff keeps blathering, another boring year with sea ice well within the range of natural variability and with no down trend. You can always imagine an end of the world scenario if you try hard enough, but nothing is trending in that direction. Griff is increasing looking like a kook from an “end of the world” cult wearing a sign on his back. Imagine? No need for that. We know the world is going to end in 12 years. Ms Griff is in a good company. Actual measurements are made from satellites, which can measure the height of sea ice above sea level. 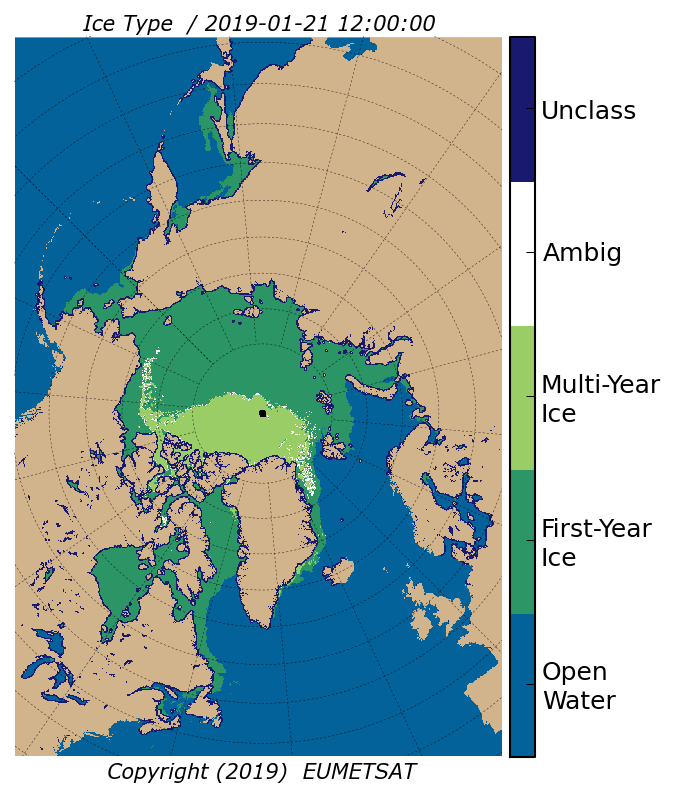 Since ice floats in water (with a known fraction of its mass below the water line and a known fraction above the water line), the height above sea level tells you the thickness of the ice, and this is measured on each satellite pass above the Arctic. The satellites used for this have an orbital period of less than two hours. I am not doubting the accuracy of the satellite data. But it isn’t an “actual measurement”. There are equations that go into calculating the ice cover, interpolating the satellite data. If you look at the calculations you’ll see that there will and must be a margin of error. There would also be a margin of error if one were to measure the thickness of an actual ice core, depending on the fraction of a meter/inch used to record the data. Averaged out, all of these errors would pretty much cancel out. But that very averaging would preclude this from being an “actual measurement”. Also, the granularity of the sampling grid will not be continuous. There will be an averaging of ice thickness between the sample locations. Hence, the “actual measurements” to which griff refers are nothing of the sort. He tries to lend his preferred data sets the authority of empirical data, denigrating the other modeling methods as mere calculations. JP, satellites take measurements that are then modeled based upon in situ measurements. Nobody is able to measure the ice with any real precision, it is all guess work. Hence the discrepancies. You did not like the Russian chart? Why to you continue your childish Climate Change DENIAL ? DMI Sea Ice Volume report for Jan 21: Volume rose 84 cu km since yesterday, to 19,913, which is 98.66% of the day’s average value in the 17-year series, and 98.50% in the DMI-charted 10-year reference period 2004-2013. The day’s average growth in the 17-year series was 78 cu km, and for the reference period 84 cu km. Comparatively, the day’s growth this year was 107.28% and 99.51% of those values, respectively. 2018 picked up 6 cu km on the day’s 17-year average, and is now 271 cu km under it. The latent heat released in the formation of the new ice is 2.56303E+19 Joules, or 2.5630E+07 TeraJoules. If I understand correctly, warming was supposed to happen first at the poles, because the polar air is extremely dry and thus the CO2 was supposed to contribute more radiative forcing than it would at the equator, correct? 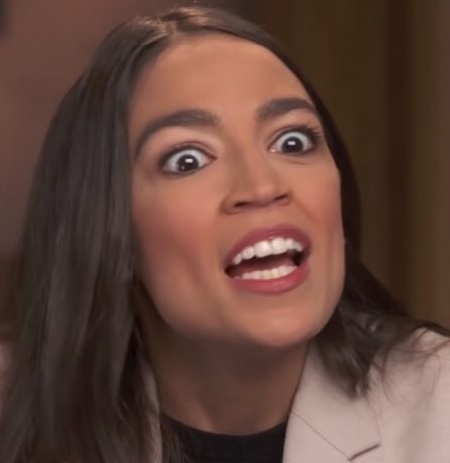 Mostly, those reading and commenting here are not from “the other side” and do not, if I am any indication thereof, understand the complex reasoning going on in their brains. Their have been statements that southern ice decreases because of warmer water gets there now (somehow) that did not get there previously. Turn that thought around. If colder water returns and melts ice less rapidly or breaks up the sea ice less, then that will grow. Unexplained is why sometimes the water is warmer and then switches to colder. Not sure this helps, but as stated, I only dimly comprehend the reasoning of those trying to explain global warming, climate change, weather weirding, or whatever. John, I think your mistake is trying to apply logic and reason. I’m afraid it won’t get you any closer no matter how hard you try. Instead, watch this clip 25 times in a row. Don’t think about it. Just keep hitting the replay button, again and again. Don’t ask why. Watch facial expressions and hand gestures. Listen to the applause. Don’t try to understand. Don’t analyze it. Feel it. Immerse yourself in the absolute cosmic clarity of the moment. How many Manhattans is that? I thought climate scientists measured in Hiroshimas. I thought it was Wadhams! A Wadhams is 1 M. sq. Km. A Hiroshima is a bigly explosion, measured in units of energy that no one in the climate business understands. A Manhattan is a traditional cocktail made with rye whiskey (whisky), sweet vermouth, and bitters. Not sure, but I think it is about 4 oz. Never could stand a Manhattan. I guess that depends on which side of it your on. How does first year ice get 4-5 meters thick? PSalmon … the program and the real science that goes into the multi year ice measurements and calculations are likely quite good and sophisticated …. the problem lies in the magnitude of the error and it is likely huge even at the best times and likely about 50% at the worst times. The first clue I had that climate science was all BS was when there were never any error margins provided with data that fools like Griff & Msr sir lap up like it is beyond questioning …. Griff has no clue how ignorant he really is. When the Ice Packs are pushed together by changes in the wind direction thin areas buckle from the compressive forces and “ridge” (form a tangle pile) or “slab” (slide over and under each other). The movement of the ice thus forms thick sections that are over 3 m; the practical limit to growth from low temperature because of the insulating effect of the conductivity of the ice and snow. In this way, the cracks that form in the winter, grow thin ice sections at a faster rate then the nearby thick sections. Those rapidly formed thin section are also the weak parts of the pack when the wind changes direction and squeezes the thin section between two thick packs. It buckles, piles up to a thick little hill. Wah La–Thick first year ice that is thick enough to resist melting out in the Spring/Summer. The cracking in the winter is actually of great benefit in increasing the ice volume more rapidly, contrary to some of the rhetoric you’ll hear. So, cracking in the winter is good for volume, cracking in the summer (sun) is bad. Who do I trust more? Several satellite records, or some random blogger? Little Man trusts those whose predictions have a 100% failure rate. Yeah, it’s a special kind of stupid. Little Man trusts those who have a 100% failure rate. Yeah, it’s a special kind of stupid. Little Man stalks Tony Heller obsessively but here he calls him a “random blogger”. Little Man also habitually rejects public record evidence posted on this blog. It would take a special kind of stupid to not recognize him as the annoying common dimwit he is. The satellite based data is what is produced above. It shows an increase in multi-year sea ice. ms slur, you really are one of the dumbest random bloggers this forum has ever seen. You would rather have them begging in the street? Heck, ride your Unicorn in to Town! Instead of heaping shame and Misery upon your back. Add some lines if you are driven. How much ice can dance on the head of a planet? DMI Sea Ice Volume report for Jan 22: Volume rose 95 cu km since yesterday, to 20,008, which is 98.77% of the day’s average value in the 17-year series, and 98.63% in the DMI-charted 10-year reference period 2004-2013. The day’s average growth in the 17-year series was 74 cu km, and for the reference period 69 cu km. Comparatively, the day’s growth this year was 128.22% and 137.83% of those values, respectively. 2018 picked up 21 cu km on the day’s 17-year average, and is now 250 cu km under it. The latent heat released in the formation of the new ice is 2.90518E+19 Joules, or 2.9052E+07 TeraJoules. The DMI Sea Ice Volume for the 2018/2019 growth season just passed the 20,000 cu km milestone, 1 day earlier than the average for the 16 ice growth season. The year to achieve the milestone earliest was 2004, 37 days before the average (December 16), and the latest was 2016/2017, 25 days after average (Feb 16). Just got back from another trip to Bolton, ON. Lowest temp -9 F just west of the Niagara Escarpment on the 401 at 02:00 Tuesday morning. Worst of the weather was along I-94 at 22:30 Wed. morning on the way back in Detroit with freezing rain with a temp of 28 F. The real danger were the non driving suckers doing 45 mph in the middle and right lanes in a 70 mph zone (65 for big trucks) there by forcing all faster traffic to the third lane which was less than well salted and had heavy slush on in in some places. That lane is restricted for big trucks but I was in it several times last night breaking trail through the slush and very happy when I splashed it on the morons in the center lane that would not get over but would speed up when I started to pass them. I do so like punishing such idiots and those big super single tires on truck and trailer do a great job of splashing the slush and water on them and at the same time clearing the slush from the lane for others that follow. The single best key to determining road conditions in such a situation is tire spray. Plenty of spray and your good to go. I even leave my drivers side window cracked 2-3 inches in such conditions so I can hear the spray from my own tires when I can’t see it from other vehicles or in my mirrors in the dark. Other tip offs are slide offs and of course the sheen on the road surface. Also noticing if ice is accumulating on mirrors and portions of the windshield outside the swipe of the wipers or on the ends of wipers themselves. And of course just keeping an eye on the outside temp. Always be aware of overpasses and bridges and ramps and especially those that have turns. Once I turned south on US 23 heading towards Toledo to catch US 24 it was smooth sailing the rest of the way as the temperature rose. It was 38 F just before I hit exit 222 to get off I-69. The bottom is supposed to drop out tonight so I topped the fuel tanks off with pretreated fuel, purged the water from the air tanks, drained any water out of the fuel filter, greased the fifth wheel, and hit the brakes hard several times doing my best to dry the pads and drums in the wet conditions before I parked the truck. When the temp drops well below freezing after wet conditions like we have now it is especially important to make sure when you pull a trailer that has been parked you check to make sure all the wheels are turning as soon as you pull it from it’s spot. Rah: I hope you don’t have to go across northern Indiana midweek next week. Forecast will be for bitter, even record-setting cold tues-wed-thu. Be safe. Would not be surprised if they send me north quite a bit during the cold spell. Some of it is just luck of the drawl but I suspect that some drivers with runs up to Michigan and Chicago will decide they need a break. Doesn’t matter really. Take what comes and do the best one can. It’s the only attitude one can have in my job and maintain a good state of mind. And THAT is the key really because all those hours in a drivers seat gives one plenty of time to dwell on things if they allow themselves to do so. DMI Sea Ice Volume report for Jan 23: Volume rose 99 cu km since yesterday, to 20,106, which is 98.88% of the day’s average value in the 17-year series, and 98.79% in the DMI-charted 10-year reference period 2004-2013. The day’s average growth in the 17-year series was 75 cu km, and for the reference period 74 cu km. Comparatively, the day’s growth this year was 131.08% and 132.71% of those values, respectively. 2018 picked up 23 cu km on the day’s 17-year average, and is now 227 cu km under it. Interesting, for the day, all the years except 2014 with above-average Sea Ice Volume declined toward the average. All the years except 2011 with below-average Sea Ice Volume rose toward the average. The latent heat released in the formation of the new ice is 3.01242E+19 Joules, or 3.0124E+07 TeraJoules.